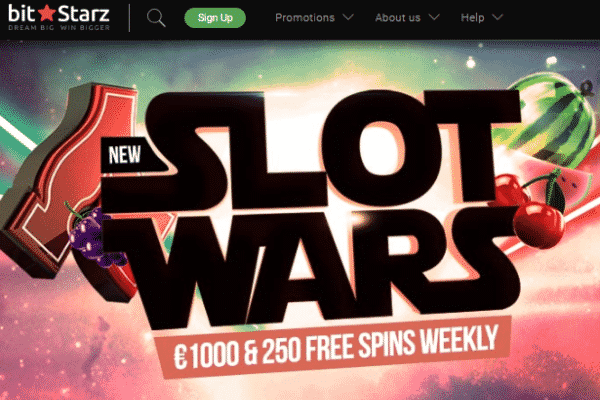 Join New Casino Tournaments at BitStarz and Cloudbet to Win Some Juicy BTC Prizes! Another weekend – another chance to earn some coins at your favorite Bitcoin casinos. Starting with today and continuing until next weekend, BitStarz Bitcoin casino and Cloudbet are running new casino tournaments that offer dozens of prizes, some of which are in free spins and others in BTC. Whether you like slots or you prefer to spend more time at the tables, both casinos will give you a chance to earn something more on top of what you collect at the games. Read on for a full report on the tournaments and their prizes and start earning some extra Bitcoins today! If you haven’t had a chance to play at BitStarz, you’ve missed out on plenty of attractive prizes. Every week the casino runs two separate tournaments that are open to anyone who spends real money while playing. One tournament is for slot players and the other only for punters at the table games but both offer fantastic prizes that are given wager-free. The slot tournament has a prize pool of €1,000 plus 250 free spins which are given to 50 players who earn a position on the official leaderboard. The highest prizes are €300, €150, and €100 in BTC equivalent while the lowest ones are 10 and 20 free spins. As for the table games tournament, the prize pool is likewise €1,000 but there are only 20 prizes to be won, starting with €500 for the top player and ending with €5 for player number 20. To qualify for the slot tournament, just play any slot you like with real money and you’ll earn points for the leaderboard with every wager placed. The table tournament, however, only accepts players that have made four deposits throughout the lifetime of their account. If you have, just play any table game you want and you can qualify for a prize. For more info about the rules and rewards, go down to BitStarz Casino and check out the Promotions page! If you want to earn even more prizes, you also have the recently-introduced weekly tournaments at Cloudbet Casino. For slot players, the casino will open a new leg of its Free Spins tournament after midnight today which will last until midnight on Sunday. The tournament has a prize pool of 1,000 free spins which will be distributed to all players who qualify, with the top prize being 260 free spins. To enter, just play the selected slot machines and the casino will give you 1 point for the leaderboard for every 1 mBTC you spend on those games. On the other hand, if you are only interested in table games, you should instead check out the Table King tournament at the casino. This tournament also runs Friday to Sunday but its prize pool is 250 mBTC. Prizes are given to the top 10 players, with the first getting a solid 75 mBTC. To earn a spot on the leaderboard, you need to play any live casino game at Cloudbet and win some cash. The more you win, the more points you get. If you think you are up for some competition, make sure to visit Cloudbet and check all the tournament rules.